This family recipe makes 2 loaves - one for now, one for later! 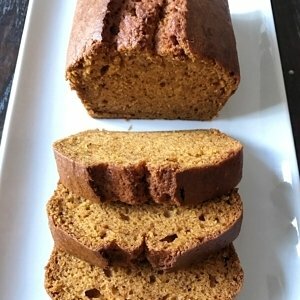 It’s the perfect classic pumpkin bread. It’s moist, has a great consistency and just the right flavor- not too sweet, not overly spiced. Made with a family recipe, I substituted GFJules all purpose flour in place of regular flour. It’s super easy, so yummy, and the house smells amazing when you bake it! It's the perfect classic pumpkin bread. It's moist, has a great consistency and just the right flavor- not too sweet, not overly spiced. Stir in nuts & raisins.